The two large plants are Ensete Ventricosum after a difficult season of high winds and grey skies. These plants have just completed their third season, the first being spent in a pot. To the left of the picture we have a group of Xanthosoma sp. (elephant ears, coco yam), with canna Altensteinii growing behind. The purple foliage at the front of the border is Amaranthus 'Hopi red dye' . 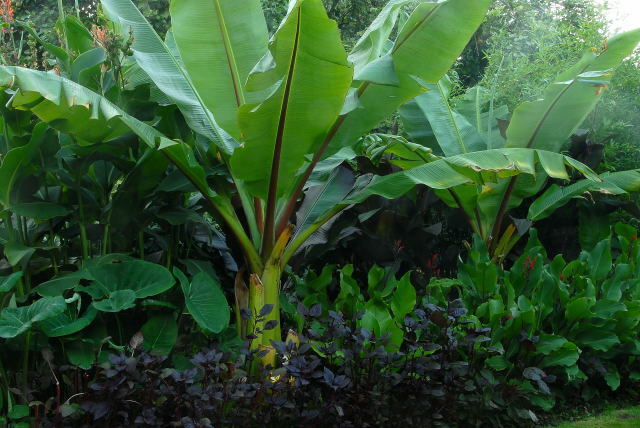 In between the two Abyssinian bananas, the green foliage is predominantly canna warscewiczii with a few juvenile Ensete enjoying their first few months of life. The dark foliage in the rear is canna indica purpurea. The bamboo phyllostachys bissetii gives some height in the top right hand corner and is the only plant out of this lot that remains during winter.